It's nearly that time of year once again folks. 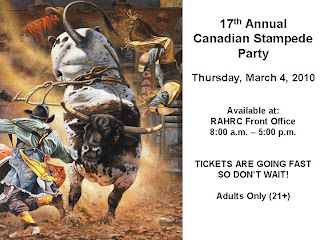 The fabulous Canadian Stampede party is coming again.... on March 4th. Tickets are notoriously hard to get (you need to be a PDO RC member), but there are still some available. If you want one, send me an email (my address is in the disclaimer) and I will put you in touch with those that can provide you your ticket to one of the best parties in town. Drinks are RO 1.000 each (got to love the subsidized piss from PDO) and there is a shooter bar that is comedy gold every year, guaranteed. DJ Hurricane is being flown in from Calgary, the home of the Calgary Stampede, and he never fails to disappoint every year. So if you fancy a spot of cow-boy watching (or pretending to be one), or line-dancing (or attempting to), then head on down to the PDO Rec Centre on March 4th..... it never fails to be a great time. Tickets cost RO 20.000 and you get dinner and a free drink. Cool! That is the best party in town in my opinion. Been there for the past 5 years and i can't wait to go again. yay it's like Christmas is coming!!! okay how do i email you ??? i want to party !!!!!!!!!!!! !